Italian painter and draughtsman. A pupil of Giovanni Paolo Lomazzo, he was one of the most important artists working in Milan during the second half of the 16th century. His career, however, is poorly documented. His chief achievement, both in quantity and quality, was as a draughtsman, but he was also a very able portrait painter, highly popular with the nobility. His earliest known work is in fact a portrait of Angelo Dannona, signed and dated 1570 (private collection). The courtly style of his portraits is evident in two other surviving works: Lucio Foppa (c. 1585; Milan, Brera), shown in a noble and dignified pose, proudly attired in elegant shining armour against a dark background, and the Portrait of a Member of the Cavalcabo Family (c. 1580; Rome, Palazzo Venezia). Here the subject is depicted in a half-length pose, turned three-quarters towards the right, his hand boldly placed on his hip. His gaze is deep and penetrating, his attitude courtly. Figino s portraiture received praise from illustrious contemporaries such as Torquato Tasso and Giambattista Marino and other less well-known poets including Gregorio Comanini, Gherardo Borgogni and Giuliano Goselini. However, most of his documented portraits are untraced. 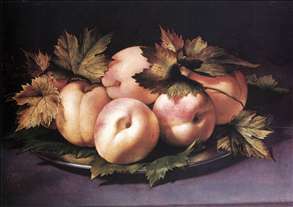 See more details about "Still-life with Peaches and Fig-leaves"
See more details about "Portrait of Lucio Foppa"